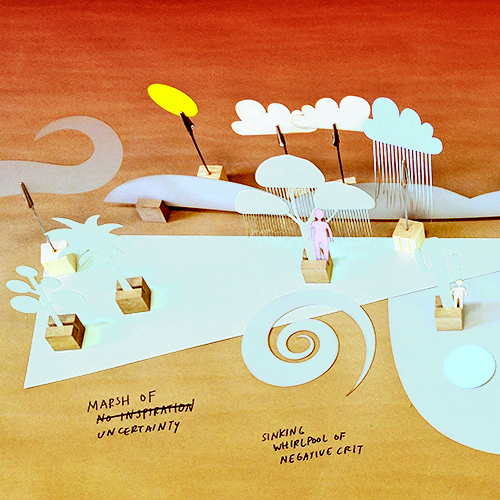 We often use landscapes as metaphors in everyday speech, particularly to talk about complex systems—understanding a complex information system as an “information landscape”, for example, helps convey the idea that such a system, like a landscape, is vast and encompasses many interacting variables. However, while landscape metaphors are common in speech—terms like “stakeholder landscape”, “lie of the land”, “ocean of possibilities”, “food desert”, even the word “field”—landscape metaphors have been used more rarely in visual applications. 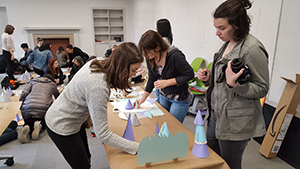 On March 30th, 45 Juniors from Carnegie Mellon University’s School of Design’s “Persuasion” class, taught by Michael Arnold Mages, Dan Lockton, and Stephen Neely, took part in a workshop to explore practically how physical and visual landscape metaphors could help elicit new insights about complex experiences—in this case, modeling and reflecting on group design projects. 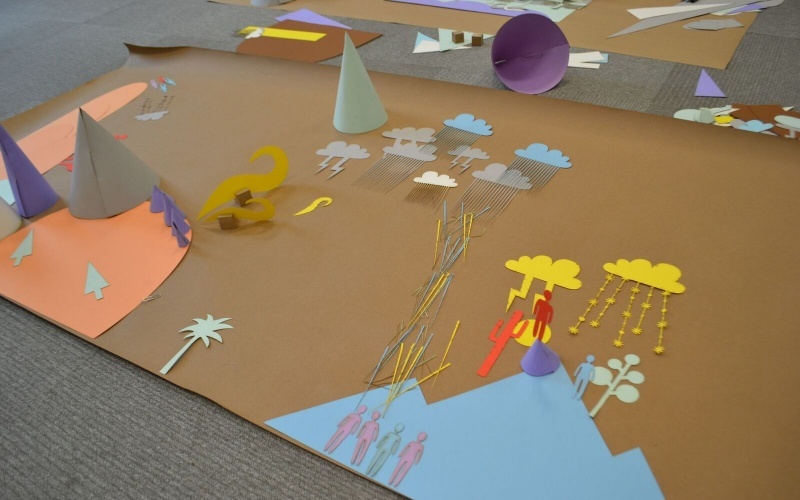 Facilitated by MA Design student and Research Assistant Delanie Ricketts and Assistant Professor Dan Lockton, as part of the School of Design’s new Imaginaries Lab, the workshop involved students collaboratively creating ‘landscape’ models representing projects they have worked on, using simple paper cut-outs of features such as hills, trees, weather, and people. 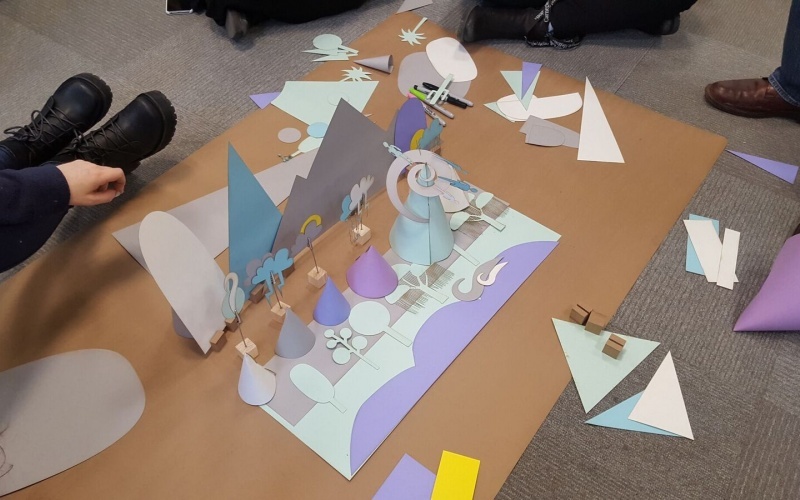 Each group used the elements in different ways to represent different aspects of their projects, through creating ‘timeline’ landscapes in both two and three-dimensional formats. 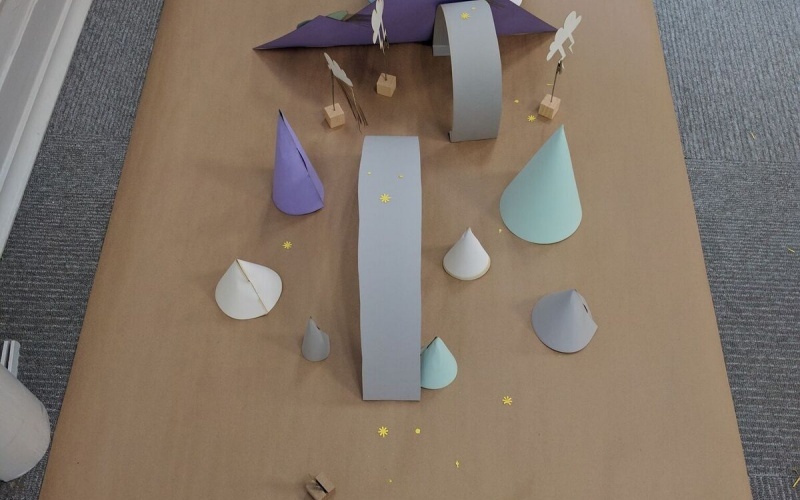 Some projects started with rocky beginnings, represented by different cones or hills, in order to show how difficult that part of the project was. 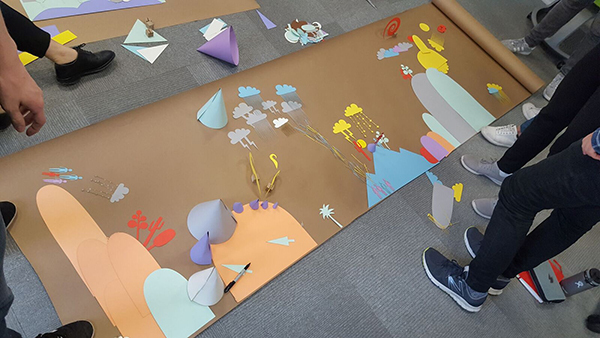 Other projects started with trees, rivers, and stars, representing periods of calm ideation, research, or general feelings of optimism. When projects encountered new difficulties later on, many groups represented these periods with lightning, rain, hills, and cones. 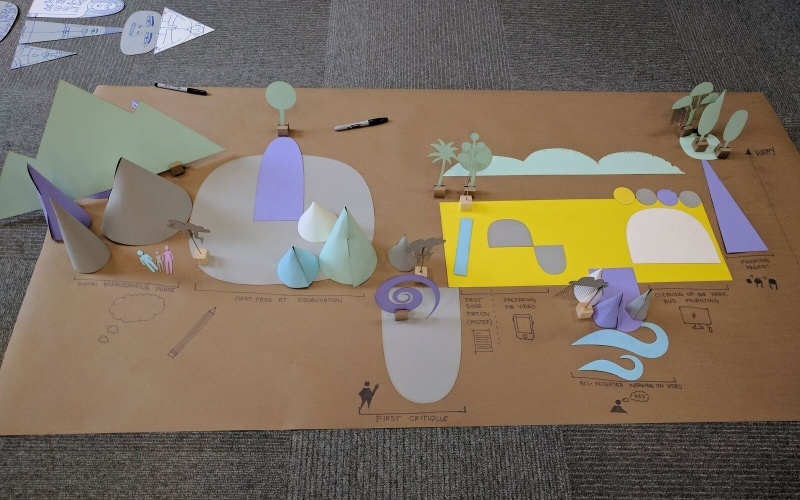 Several groups used (and came up with names for) metaphors within the general landscape metaphor to represent specific parts of their project experiences, such as a “plateau of exhaustion” before the project came to an end. 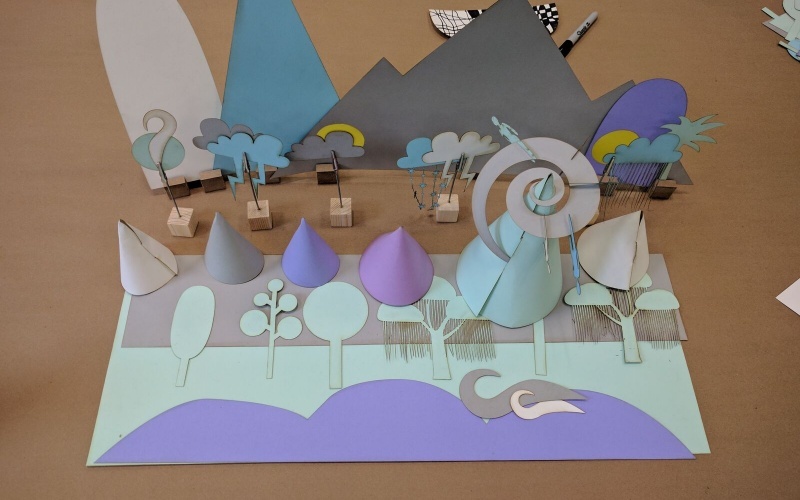 Delanie’s previous prototypes of the landscape metaphor visuals, as part of her research assistantship project, have focused on how they could facilitate individual reflection on one’s own career path. 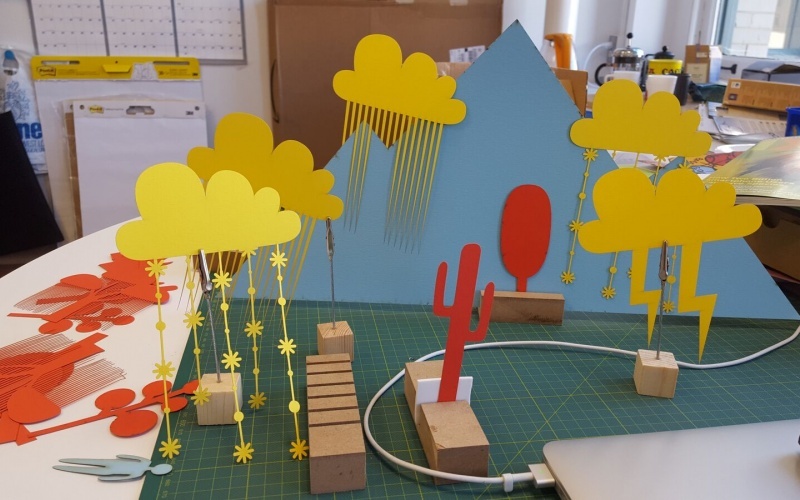 However, while people found the metaphor and elements to be a useful and creative reflection tool, several expressed that it was difficult to show how their perspective changed over time within a two-dimensional format. In this second iteration of elements, we aimed to provide greater variation as well as enable three-dimensional expression. 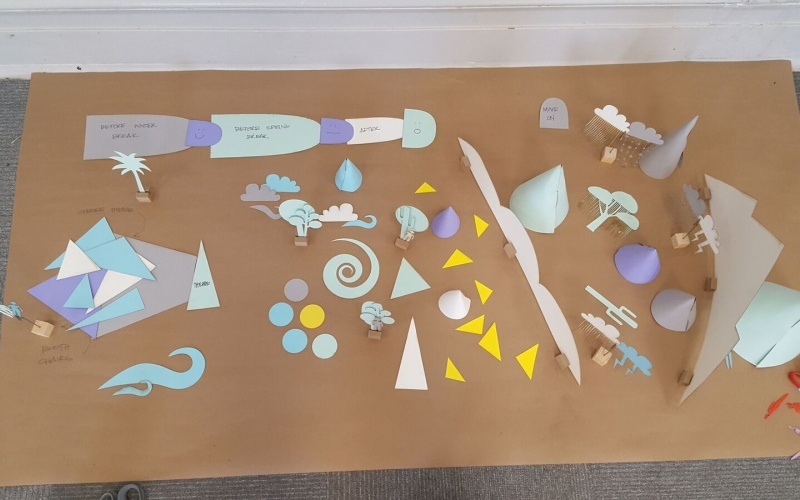 In addition, we wanted to explore how the metaphor could be used to think through a different topic, project planning or reflecting rather than career, and in a group rather than individual context. 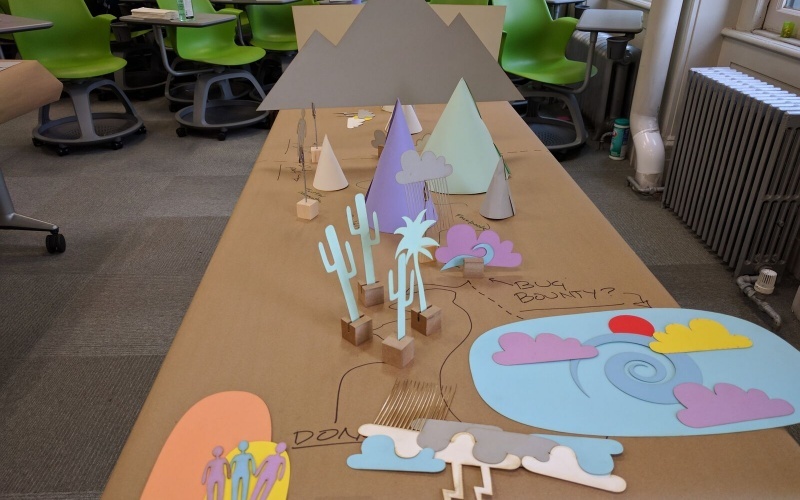 Students’ responses to trying out this second iteration of landscape elements, applied to group projects rather than individual career paths, suggested that they found the process fun and creative, while also abstract. 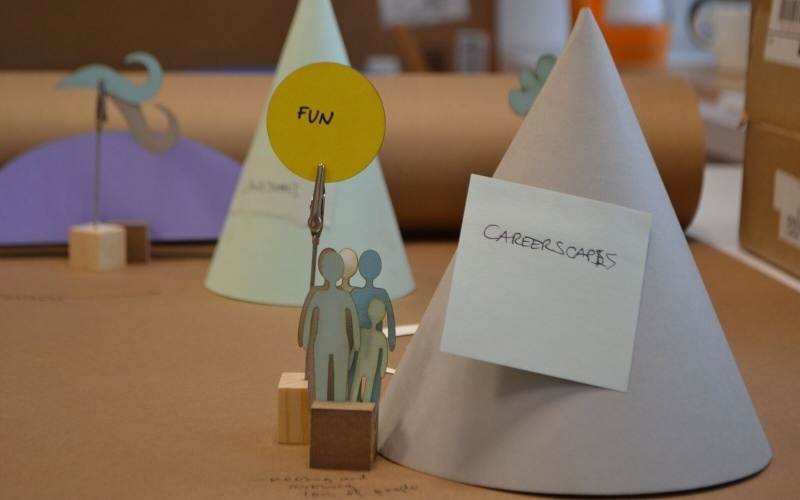 Many participants commented that the tool helped them understand their project and teammates’ perspectives better, especially in terms of stress, productivity, and overall emotional satisfaction at different points throughout a project’s lifetime. The format is more useful for surfacing — and reconciling — overarching understandings than probing deeper insights about the specifics of complex experiences, but, in triggering discussion, it has value in enabling members of a team to understand and interrogate each other’s perspectives and mental models of a situation (echoing ideas from organizational systems thinking experts such as Peter Senge). 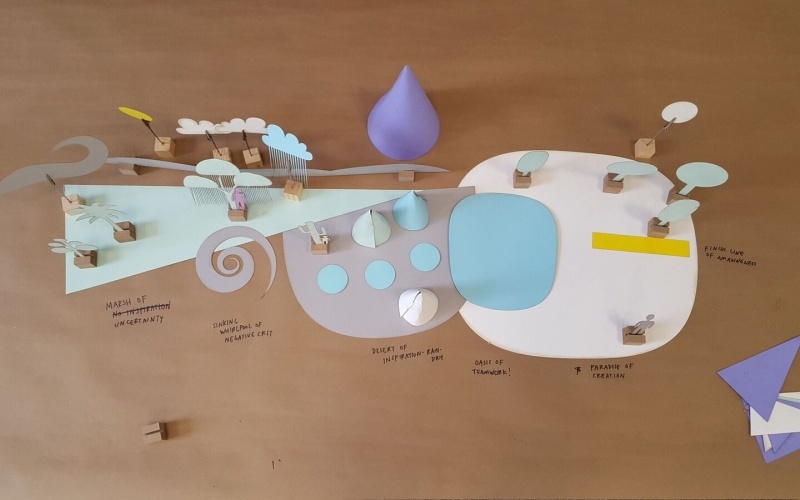 We aim to develop the landscapes kit further, through iterations with application in individual reflection, project planning, and research settings. 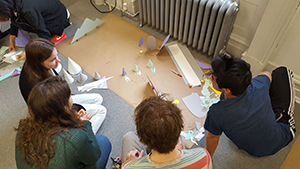 Many thanks to Chris Stygar, Josiah Stadelmeier, and the whole School of Design 3D Lab for their help in developing the materials for the project, the Design graduate students and juniors for taking part in the different stages of the project, and Manya Krishnaswamy for helping facilitate. Thanks to Joe Lyons for putting the article on the School website.